Perfectly pleasant pub in the old town area of Greenwich, near the entrance to [Greenwich Park]?. 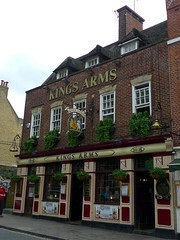 This location makes the King's Arms a popular place, but even early-evening on Saturday it was still possible to find a table as there's plenty of space. It's made up of several adjoining spaces, breaking it into cosy areas, with the addition of an open fire and plenty of historic photos on the wall. There's a food menu (standard fare), with all mains coming in between £6 and £9 maximum, and a wine list which ranges from £11 to £15 for bottles. There's real ale on tap, such as London Pride, Courage Best Bitter and Old Speckled Hen. Last visited by Ewan and others, 8 March 2008. Last edited 2013-05-10 07:27:11 (version 8; diff). List all versions. Page last edited 2013-05-10 07:27:11 (version 8).